The front drive of The Ritz-Carlton Laguna Niguel resort is filled with six beautiful eight-foot eggs painted and designed by celebrated local artists and surfboard shapers, including Trevor Mezak, James Galindo, Robin Hiers, Kym de los Reyes, Album Surf, and new this year, Jessica Osbourne. Each egg evokes a different inspiration – from beautiful Southern California beaches and surf culture to art legends and nature. The Easter egg artistry program was started in 2017 as a way to embrace and showcase our local talent, while celebrating the holiday and providing a fun photo backdrop for the family. Since launching the program, the resort strives to add a new artistry egg to the collection each year. Jessica Osborne grew up in a small town in Illinois and moved to California right out of high school. She always liked drawing but didn’t pick up a paint brush until she was 24 in 2004. Inspired by the beautiful nature of California she started painting small landscapes and then was motivated a few years later to try abstract and contemporary art. She has since been collected widely for her abstract pieces. Hiers has a signature style that is recognizable right away. Influenced by pop culture, fashion, the beach life, and beautiful people, her art is a reflection of the times. Currently residing in her native Laguna Beach, she is capturing the life that is a feast for the eyes. A native Southern Californian, Kym De Los Reyes is establishing a presence in her community and nationally. Her work is currently being collected throughout the U.S. She had been represented by The Gallery Downtown in Pomona. Kym is thrilled to be represented currently by Laguna Gallery of Contemporary Art in Laguna Beach and Emerald C Gallery in Coronado. During his senior year in high school, James enrolled in figure drawing classes at College of the Desert in Palm Desert, Calif. It was then that he discovered his passion for figurative art, which encouraged him to pursue a higher education at Laguna College of Art & Design. After eight years of intense study, James graduated with a Master’s Degree in Fine Art. He has been the recipient of multiple scholarships and awards. James currently lives and works in Los Angeles, and teaches drawing and painting classes at Laguna College of Art & Design and Los Angeles Academy of Figurative Art. Learn more about Jessica’s work at www.LGOCA.com or contact the Laguna Gallery of Contemporary Art at (949) 677-8273. Learn more about Robin’s work at www.LGOCA.com or contact the Laguna Gallery of Contemporary Art at (949) 677-8273. Learn more about Kym’s work at www.LGOCA.com or contact the Laguna Gallery of Contemporary Art at (949) 677-8273. Learn more about James’ art at www.DawsonColeFineArt.com or contact Dawson Cole Fine Art at (949) 497-4988. As readers may recall, on Tuesday, Feb 19, an on-duty LBPD officer accidentally hit an adult bobcat with his police vehicle in the 2700 block of Laguna Canyon Road. “The bobcat ran across the highway in front of the officer’s vehicle and the officer was unable to avoid the collision. The officer immediately stopped and asked for an Animal Services Officer to respond,” LBPD Civilian Services Administrator Jim Beres said after the accident. Officer Thomas McGuire was responding to a call of a person in the road when the cat darted out in front of him. After striking the animal, Officer McGuire and Cpl. Darin Germaine, who was in a patrol car behind him, rushed to assist the bobcat. The Animal Services Officer transported the injured bobcat to the Serrano Animal and Bird Hospital in Lake Forest. After almost two months at the facility, rehabilitating from head trauma and a broken sternum that healed with cage rest, the bobcat was released into a remote Laguna wilderness area believed to be where he came from. With OC Park Ranger Roxanne Bradley at the wheel, we traveled over some pretty rugged terrain to reach the release point. Dr. Scott Weldy and Lauren Genger RVT managed to get the carrier into a small ravine and opened the cage. The bobcat was a bit reluctant but when they jiggled the cage, the cat ran at lightning speed into a thick bush area. Thank you LBPD and OC Park Services (and Roxanne for the bumpy ride) for allowing Stu News to be part of the release. It was a magnificent thing to witness. “This is going to be the longest day of my life,” says Christine Hall on the morning of April 12, her last day at Pavilions Boat Canyon after working there for 15 years as a checker. In a few minutes, it’s clear why it won’t be short – or easy. Customers approach to hug her and say goodbye, expressing how much they’ll miss her. It’s obvious what she’s meant to them, and them to her. Retiring is good but leaving friends and co-workers can be emotional. Altogether, she’s worked for Vons for 25 years, first in Yorba Linda and then at Smith Food and Drug after they merged with Vons. That means a lot of customers have come through her line. Although Christine has many happy memories of her time at Pavilions, she says, “The most rewarding thing I’ve ever experienced is taking care of my father-in-law and mother-in-law after I transferred to this area. We were living on 29th Street in Newport Beach. We sold our place and moved in to take care of them until they passed away. We did that for six years.” Her father-in-law passed away in 2004, the year she started at Vons Boat Canyon, and her mother-in-law passed away in 2007. When you deal with so many people, inevitably there must be weird and quirky memories along with the favorite ones. And because the store can’t sell liquor before 6 a.m., or to anyone who is visibly intoxicated, some customers balk at those rules and must be ushered out of the store. Also, on the occasions when customers who have obviously already imbibed, try to buy liquor and their cards are declined, they’re not happy. As difficult as it must be to say goodbye, Christine and her husband of 38 years, Roger, have new endeavors on the horizon. After selling their place in Costa Mesa in March, they purchased a home (with a pool and a putting green) in Glendale, AZ. Roger has already moved there. He was a Ferrari mechanic for many years but now is behind a desk as a Ferrari parts consultant, well deserved, it seems, after working so many years in and under cars (even though they were Ferraris). Christine wanted to transfer to a Vons/Pavilions in AZ, but tells me it’s a right-to-work state and some of the stores are union and some are not. The Union said she’d have to start at the bottom and work her way up again. The day after Christine retires, she and her husband will be on their way to move the rest of their things in the first of a couple of trips to their new home. Although she will be sorely missed at Pavilions, that’s a wonderful way to picture her in her new life – by the pool, taking in Arizona’s magnificent sunsets. The folks at the 32nd Police Employee Recognition Brunch stood on their feet more than they sat down at their tables. They were giving standing ovations to the officers and civilians who were being honored for their service and protection of the residents and visitors to Laguna. The Exchange Club of Laguna Beach hosted the brunch, held April 11 at [seven- degrees], at which 64 awards were given for outstanding service to the city in 2017 and 2018. Police Chief Laura Farinella welcomed the packed audience, the largest ever to attend the ceremony, she said, before introducing Mayor Bob Whalen. Whalen expressed his gratitude and respect for the department. As is his wont, Whalen gave the audience a laugh. “If you ever plan to have a mounted (horseback) patrol, don’t look at me,” said Whalen, who is recovering from a riding accident in Chile in which he did serious damage to 11 vertebrae. Unfortunately, none of Laguna’s well-trained police officers were in Chile to give him a helping hand. Officer Mike Short would have known what to do and just as important, what not to do. Short was named the 2018 Officer of the Year, as well as receiving numerous other awards. After 14 years in the department, Short has performed admirably in various positions, currently serving as the department’s Training Officer. Professional Employee of 2018 honors went to Jordan Villwock, the City’s Emergency Management Coordinator. His title doesn’t begin to cover all of his work. In 2018, he applied for grants that totaled $1.6 million. He was recognized by the California Office of Emergency Safety for his City Hazard Mitigation Plan, announcing it was the best the committee had ever seen. Villwock is responsible for the city’s evacuation plan and was awarded the state Emergency Services Gold Medal for the plan, which is now a template for other communities to follow. Corporal David Gensemer was named the 2017 Officer of the Year, among other awards he collected at the brunch. Gensemer has been with the department since 2006. He started as a Beach Patrol/Booking Officer. A short year later, he was hired full-time. Since then he has held several diverse positions and is assigned to Major Crimes Investigations in the Detective Division. The 2017 Professional Employee of the Year Award went to Kristen Berry. The California Public Safety Dispatchers Association beat the department to the punch. That organization named her Supervisor of the Year in 2016. Nominated each year for the department’s award, she was unable this time around to dissuade her colleagues from voting for her. “The Blue Flame Awards go to the officers who have ‘Fire in their Bellies,’” said Police Chief Farinella, her highest accolade. Corporal Jason Farris, winner of the 2017 Blue Flame Leadership Award, presented the 2018 award to Corporal Cornelius Ashton. Both have carved out special niches in the department. Farris was the city’s first Community Outreach Officer, a positon dedicated to working with the homeless and mentally ill community. He reacts to the needs of this community fairly but firmly. To his credit: 130 people have been united with family members through the Operation Homecoming program. Ashton has made his mark as the department’s School Resource Officer. The position began at the start of the 2018-2019 school year. He is at the school as often as the teachers and the students, walking the campus on a daily basis, greeted by students. He created “Student Spotlight,” a video series about young people at the schools who are making the best of their lives despite the struggles. His own life was altered by a school resource officer and he is paying it forward. The final Blue flame Award was presented to a man who is gratified by the award, but would have preferred receiving it in private. Captain Jason Kravetz is notorious for avoiding the spotlight, especially when it is something that really touches him. Too bad, no way was he going to be allowed to sneak out the back door into retirement. Kravetz has spent almost 30 years serving the City of Laguna Beach. He has been awarded the Medal of Lifesaving, the Medal of Courage, the Medal of Merit, Officer of the Year Award and most importantly, the respect of his peers. More than 60 awards were presented at the brunch. The list of recipients of all other awards is included in a separate story. Where’s Maggi – the answers! This sculpture is on the radar of a few Stu News readers. They knew where Maggi took this photo – on Coast Highway at Pearl Street. First on it was John Joseph. Next up were Pat Carpenter, Grace Roxas Morrissey, and Jane Swintek. Thanks for keeping Maggi on her toes, and for sending in your answers! Participants in the 2019 Leadership Laguna Citizen’s Academy will receive certificates of completion at tonight’s City Council meeting. 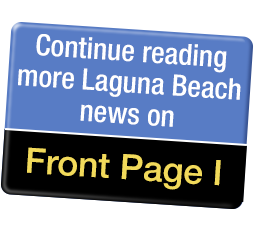 The certificates confirm the successful completion of the program, which consisted of five, two-hour workshops that introduced the Laguna Beach residents to the inner workings of the city government. The workshops were held on Thursday evenings, beginning March 7 at the Susi Q. Participants were introduced to volunteer opportunities to become involved by serving on City commissions, boards or committees and perhaps even to consider running for City Council. Speakers included City Manager John Pietig and heads of departments. They discussed how City Hall runs, some of the issues facing the city today and what residents can do to become more engaged in the community. Participants evaluate the speaker and the program, recommending what they would have liked to have seen and heard more or less of and from whom they heard it. The academy was the brainchild of former Councilman Rob Zur Schmiede and Planning Commissioner Anne Johnson, and she continues to be involved. About as green as it’s going to get! A record-breaking crowd attended the 2017-2018 Police Department’s Employee Recognition Ceremony, held April 11 at [seven-degrees]. More than 60 awards were presented. Besides the 2017 and 2018 Officers of the Year, Employees of the Year and the Blue Flame Awards (see accompanying story), service to the city was recognized in a variety of awards. The first award of the day was presented to psychologist Heather Williams by Captain Jeff Calvert. “For the third straight year, more officers have committed suicide than have died in the line of duty,” said Calvert. Laguna Beach officers have someone they can turn to in managing the daily stress; Williams, who helps officer’s cope with the aftermath of loss or traumatic action. Calvert personally knows how valuable Williams is to the department. The day after Calvert’s close friend, Officer Jon Coutchie, was killed, Calvert called Williams and she helped him get though the pain. Williams was presented with the 2018 Citizen Appreciation Awards and received the first of the standing ovations to honor the award winners. The second Citizen Appreciation Award went to Sande St. John, the very definition of volunteer. “Sande, we simply couldn’t make things happen without you,” said Police Chief Laura Farinella. Reserve Officer Christian Flagstad was awarded a commendation for his 520 hours of uncompensated service to the city – at least monetarily; he has the respect of the department. Ribbons of Commendation are awarded to members of the department who perform or conduct themselves in a manner worthy of more than a written commendation. Some of them received awards for 2017 and 2018. Ribbons were presented to recipients: Detective Sgt. Jim Cota, Detectives Kyle Milot, Mark Lillienfeld, Ryan Hotchkiss, Luke Gilbertson, James Gramer, David Gensemer, Brandon Drake and Joy Butterfield; Officers Jeremiah Kennedy, Shar Hariri, Fred Yeilding and Mike Short; Cpl. Thom Spratt; School Resource Officer Cpl. Cornelius Ashton; Beach Patrol Officer Grant Brakke; Community Services Officer Natasha Hernandez, and Dispatchers Jennifer Query and Angie Cleveland. Medals of Lifesaving were awarded to Officer Alex Diaz and McGuire for saving the life of a visitor to Laguna who suffered a heart attack. Short, Dispatchers Jennifer Neuenschwander and Lana Grover were decorated for saving the life of a woman whose husband reported she was not breathing and was cold. They helped bring her back. Medals of Valor are awarded for heroic action above and beyond the call of duty. Honored at the brunch were McGuire and James Michaud for their efforts to try to “talk down” a tense situation involving a woman with a gun. The brunch was hosted by the Laguna Beach Exchange Club, initiated by St. John. Event sponsors included [seven-degrees], Mozambique, Skyloft, Marine Room, the Crevier Family Foundation, MacGillivray Family Foundation and Diamond DJ’s.